Surf’s up! X-Men Origins: Wolverine star Liev Schreiber joined friend and fellow actor Simon Baker in Sydney Australia On Friday (December 20) with their sons for some surfing, sand, and sun. Both Liev and Simon had a blast teaching the kids to surf, laughing and splashing as they chatted and wrestled around in the waves. 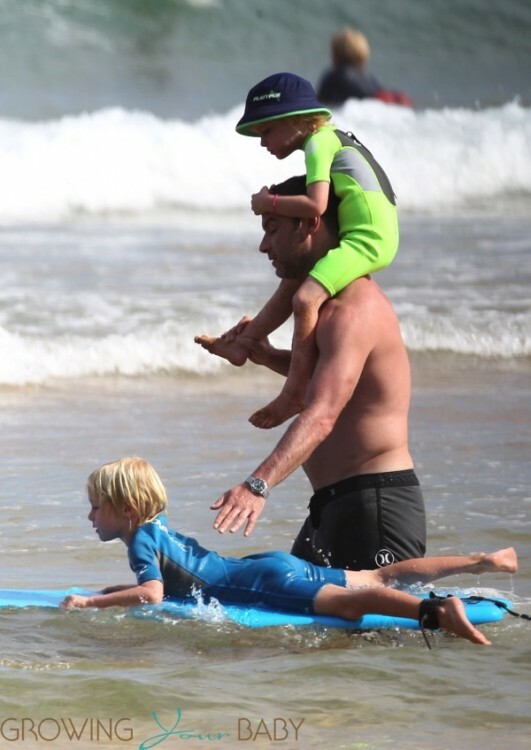 Liev was photographed carrying his youngest son, Samuel on his shoulders as they waded through the water, and was later seen pushing Alexander around on the surfboard, while buddy Simon joined his son on a board of their own. Alexander was all smiles as dad gave him a nudge, showing him how to master the waves. His brother Sammy hung on tight to dad, sitting on his shoulders and watching as he instructed Alexander how to paddle on the board. Both boys might be fair-haired like their mom—Liev’s long-time partner, Naomi Watts—but they set themselves apart with different colored wetsuits on this outing. Alexander sported a blue O’Neil suit, while Samuel donned a bright green one. While the brothers were suited up for surfing, the doting dads played it casual in relaxed swim trunks. Naomi Watts is currently filming While We’re Young, a comedic drama set to release in 2015, and is gearing up for her role in the upcoming thriller, Holland Michigan. Liev and Naomi are often spotted on holiday together in Sydney spending time with family. Liev is currently busy filming his role as Boris Spassky for his upcoming movie Pawn Sacrifice, a biographical drama about American chess champion Bobby Fischer, but it looks like he’s making the time for some quality downtime with friends and family in beautiful, sunny Sydney in between filming. If they get more time in at the beach Alexander and Samuel will be surf pros in no time! Now if only their dad could teach all of us to surf like that!